David R. Scott began his professional career after graduating fifth in his class at West Point in 1954. After completing flying training, he served as an Air Force fighter pilot stationed in the Netherlands until 1960. He then earned two graduate degrees at MIT, followed by completing the Air Force Test Pilot School. In 1963 he was selected in the third group of NASA astronauts. During the next eight years he flew three space missions: Gemini VIII, the first docking in space, March 1966; Apollo 9, the first test flight of all spacecraft and flight operations for the Apollo lunar mission (except landing), March 1969; and Apollo 15, July 1971, for which, as Commander, he received NASA’s highest award “For leading the most complex and carefully planned scientific expedition in the history of exploration…”. After entering the private sector in 1978, Col. Scott formed several US corporations conducting business in the US and England. Businesses activities included project management consulting, the development of opto-electronic sensor technology; and commercial applications of space technology. After the loss of the Space Shuttle Challenger in 1986, he served for four years on the Commercial Space Transportation Advisory Committee (COMSTAC) to advise the Secretary of Transportation on the conversion of military ICBMs to commercial Expendable Launch Vehicles (ELVs). He is currently President of the Baron Company, Ltd. a Bermuda company formed to pursue several unique opportunities in commercial space sector. During 1997, Col. Scott was the Technical Advisor to the Director of the movie Apollo 13, Mr. Ron Howard. Subsequently, during 1998, he was technical advisor on all 10 episodes of the Emmy award winning HBO TV series, “From the Earth to the Moon,” produced by Tom Hanks. During 2005, he was technical consultant on the 3D IMAX film, “Magnificent Desolation,” depicting Apollo lunar surface activities, produced by Tom Hanks and the IMAX Corporation. Col. Scott is the co-author of Two Sides of the Moon, a parallel autobiography with cosmonaut Alexei Leonov describing their insight and experiences in the Cold War Space Race. General Leonov conducted the first spacewalk aboard Voskhod 2 in March 1965 as was to have been the first man on the Moon for the Soviet Union. The book was published in 2004 by Simon & Schuster in the UK and by St. Martin’s Press in the USA. He is currently a member of the Brown University science teams on the Indian Chandrayaan-1 lunar orbit satellite as well as the NASA “500-Day Lunar Exploration Study.” He is also a Collaborator on the NASA research investigation entitled “Advanced Visualization in Solar System Exploration and Research (ADVISER): Optimizing the Science Return from the Moon and Mars,” an Immersive Virtual Reality facility at Brown to enhance geology science return from the exploration of the Moon and Mars. Col. Scott has logged more than 5,600 hours flying time in 25 types of aircraft, helicopters, and spacecraft, including 546 hours in space which included over 20 hours of Extravehicular Activity during five separate EVA excursions. He is also the holder of 15 patents in the U.S., Europe, and Japan covering inventions in the areas of spaceflight operations and robotic planetary exploration. He holds a Bachelor of Science degree from the U.S. Military Academy at West Point, 1954; a Master of Science degree in Aeronautics and Astronautics from MIT, 1962; the degree of Engineer in Aeronautics and Astronautics from MIT, 1962; and an Honorary Doctor of Astronautical Science degree from the University of Michigan, 1971. He is a graduate of the USAF Experimental Test Pilot School, 1963, and the USAF Aerospace Research Pilot School, 1964. Col. Scott is a Fellow in the American Astronautical Society, a Fellow in the American Institute of Aeronautics and Astronautics, a Fellow in the Society of Experimental Test Pilots, and a member of Tau Beta Pi, Sigma Xi, and Sigma Gamma Tau scholastic honor societies. For his accomplishments, Col. Scott has been awarded three NASA Distinguished Service Medals, the NASA Exceptional Service Medal, the Air Force Distinguished Service Medal with Oak Leaf Cluster, the Air Force Distinguished Flying Cross, the Presidential Medal of Freedom, 1970, the National Aeronautics Association Robert J. Collier Trophy, 1971, the Air Force Association’s David C. Schilling Trophy, 1971, the Federation Aeronautique Internationale Gold Medal, 1971, and the United Nations Peace Medal, 1971. He is married to Margaret Black, former Vice Chairman of Morgan Stanley Inc. and recently the founder and owner of Beverly Hills Wealth Management LLC, a Registered Investment Advisor company serving high-net-worth clients in California and Florida. The couple has homes in Los Angeles, California, and Jacksonville, Florida, and travel frequently to New York and Europe. 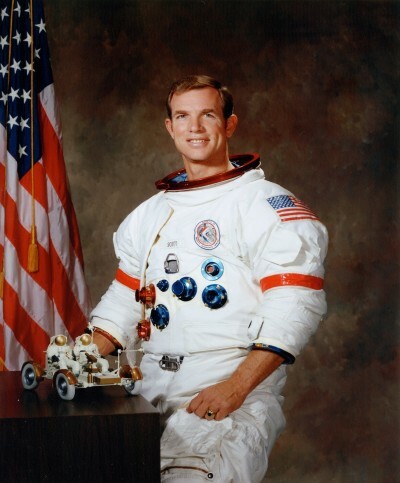 David Scott was inducted into the U.S. Astronaut Hall of Fame on March 19, 1993.